Biofilms thrive within drinking water distribution networks, and can present human health concerns by harboring pathogens. This work demonstrates the disruption and removal of mixed species biofilms prevalent in commercial and residential drinking water plumbing. Biofilms are ubiquitous in municipal drinking water distribution systems, and they present significant human health concerns because they are capable of harboring pathogens. Biofilms are able to serve as pathogen reservoirs by supplying nutrients and shielding pathogens from disinfectants. Although residual disinfectants in drinking water are mandated by the U.S. Environmental Protection Agency (EPA) for microorganism control in drinking water distribution systems, biofilms persist despite exposure to disinfectants because the extracellular polymeric substance produced by biofilms consumes the disinfectant, thereby hindering or preventing disinfectant permeation. Illustration of a microplasma jet array impinging on a biofilm (yellow surface, gray and white cross-section). 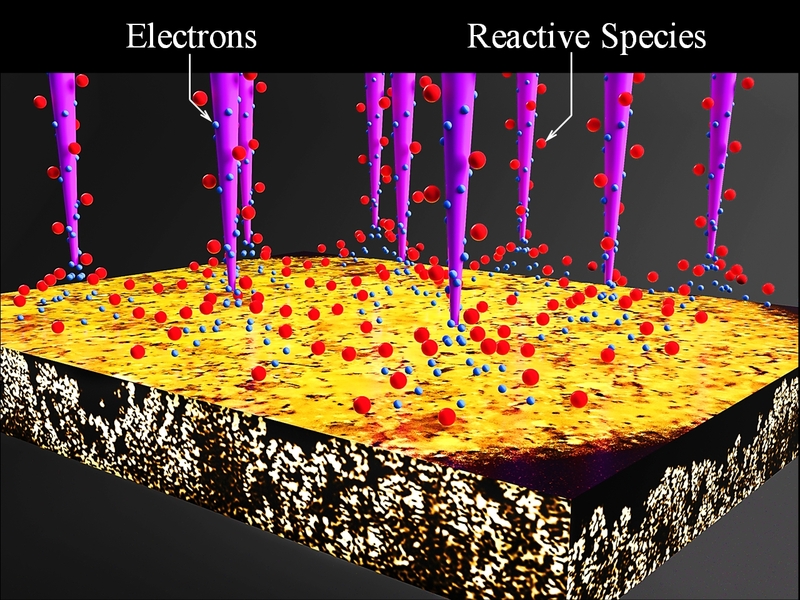 Electrons and molecular reactive species (excited molecules and radicals) produced by the microscopic plasmas are shown in blue and red, respectively. (Graphic created by W. Chen and P.P. Sun, University of Illinois). We report in npj Biofilms and Microbiomes the disruption and erosion of biofilms, grown under simulated premise plumbing conditions, with an array of microplasma jets generated in microchannel/electrode structures fabricated by three-dimensional (3D) printing. The approach proposed here for the control and removal of biofilms in commercial and residential drinking water plumbing represents a significant departure from those available in the past that have typically depended on chlorination. Through the choice of the feedstock gas and the microplasma jet characteristics, one is now able to specify the predominant radicals and molecular excited species generated by the plasma and its interaction with ambient air. Precisely tailoring the plasma chemistry at the point of use and matching particular plasma-generated species with specific biofilms is now feasible. The in situ application of low temperature plasma jets to biofilm control and removal has no precedent, and yet offers targeted treatment (localized and tailored to specific biofilm compositions or structures) of residential and commercial water systems. (Left) Arrays of microjets of low temperature plasma quickly disrupt and remove the biofilm shown by the cross-sectional, Optical Coherence Tomography (OCT) images shown at right. This technology appears to be of particular value for intervention in those circumstances in which residential or commercial plumbing is known to have been compromised by one or more pathogens, and previous and persistent efforts to purge or disinfect the system have proven unsuccessful. Arrays of microplasma jets provide a chlorine-free and in situ tool for controlling biofilms and pathogen populations with a degree of specificity (with regard to spatial localization and customized treatment of various biofilms) not available previously. 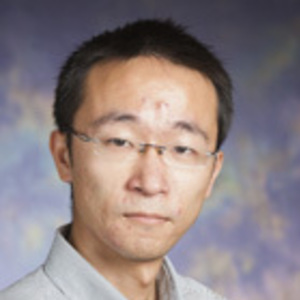 This study was guided by Professors Thanh H. Nguyen (Department of Civil and Environmental Engineering, principal investigator for EPA grant no.R834870), J. Gary Eden (Department of Electrical and Computer Engineering, principal investigator of U.S. Air Force Office of Scientific Research under grant no. FA9550-14-1-0002), Stephen A. Boppart (Department of Bioengineering, Department of Electrical and Computer Engineering, principal investigator of NIH grant R01 EB013723) of the University of Illinois, Urbana, Illinois, USA.